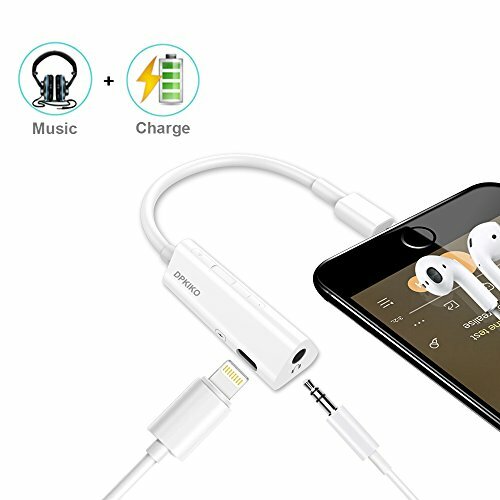 Audio & Charge: Designed for iPhone X iPhone 8 / 8 Plus / iPhone 7 / 7 Plus, 2 in 1 Lightning audio splitter allows to use headphone and charge at the same time. Impressive Sound Quality: Support up to 24-bit/48 kHz audio output;Also supports 3.5mm AUX in the car. Music Control :Volume down and Volume Up ,Single Click for Pause / Play. Just enjoy your favourite music anytime and anywhere with DPKIKO Lightning Audio Adapter. Plug & Play: Just insert your charger or earphones into the jack and then it plays, no App needed, no additional software needed. Iphone headphone adapter for 7, 8 and x iPhones.